This recipe is super easy to make and requires just two ingredients: coconut oil and dandelion flowers. Coconut oil, reputed to have many health benefits when used both internally and externally, is readily available in most areas. I live in small town USA and found two types to choose from in my local grocery store. I buy it in larger quantities for soap making and other projects, through Mountain Rose Herbs. Dandelion flowers have been traditionally used to heal rough, chapped skin and soothe sore, achy muscles. In this recipe, it also lends a natural, buttery-yellow tint to the finished product. Not only is this combination great for human skin, but I safely use it on my dogs as well. 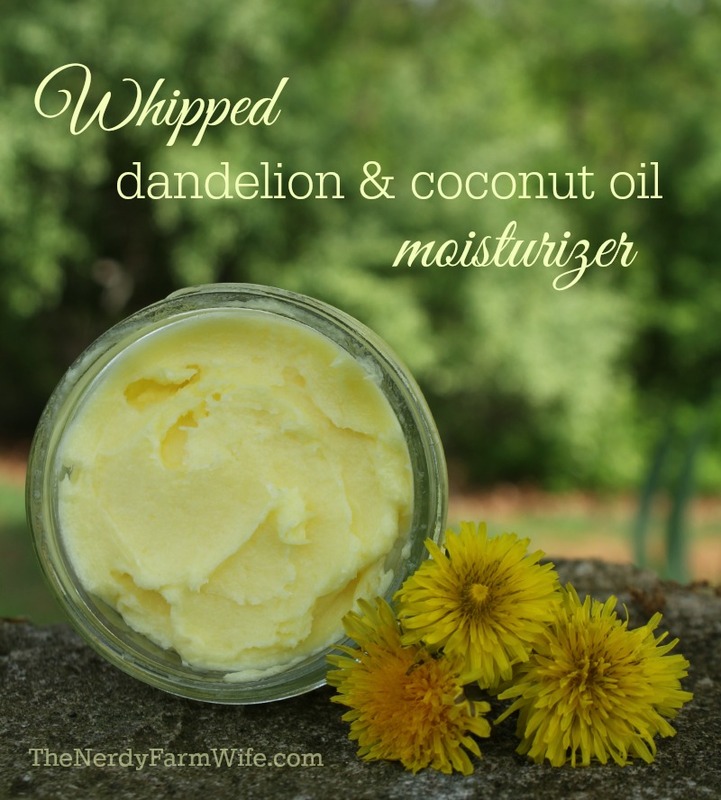 Here are a few ways to use whipped dandelion coconut oil moisturizer, but you can probably think of plenty more! Use straight on the skin as a moisturizer. Use as a treatment for flaky scalp. Use as a soothing aftershave. Use as a massage cream for sore back, legs, and feet. Use on your pet’s skin irritations. Once you’ve picked your flowers, leave them in a sheltered spot outdoors for an hour or two to let any little ants and such crawl away. Bring them inside and let them finish drying, spread out in a single layer over a clean dishcloth or paper towel. Let your dandelions air dry for several days or even up to a week or two before using. and add them to a heat proof glass jar. Set this jar down into a saucepan that contains a few inches of water in the bottom. This will create a make-shift double boiler of sorts. Set the pan over a medium-low burner for about two hours. 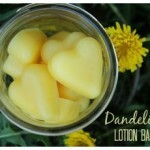 This indirect heat melts the coconut oil and helps infuse the goodness of the dandelions into it. Keep a close eye on everything to make sure the water doesn’t all evaporate out. Remove from heat and strain into a small mixing bowl or pitcher while still warm. Tuck the strained oil into the refrigerator until firm. Using a hand mixer, beat the chilled coconut oil for about five minutes or until it’s light and fluffy. I like to leave this moisturizer unscented, but you could add a few drops of skin safe essential oil such as lavender or peppermint, if you’d like. Spoon into jars and store in a cool place. The amounts given should perfectly fill one four-ounce jelly jar. It will melt easily, so if you have a warm house, store it in the refrigerator. It will harden from the cold, but just let it sit out at room temperature a while before use. Do you enjoy making things with the flowers and plants that grow around you? If so, let’s keep in touch! 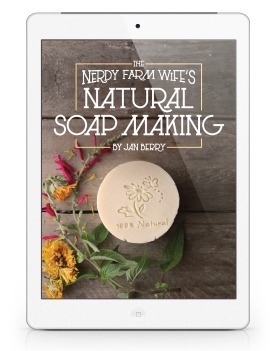 Subscribe to my newsletter HERE to get my latest herbal projects, body care recipes & soap making ideas sent straight to your inbox once (sometimes twice) each month. No spam ever, unsubscribe at any time. If you like the projects on my site, you’ll LOVE my new book! Tagged creams, dandelions, lotion, salve. Bookmark the permalink. I may have to try this! I bought some coconut oil b/c it seemed to be the thing to do and now I never use it. It’s kind of overwhelming how limitless the possibilities are! This sounds wonderful! I may have to make it this year! This sounds amazing! My kids and I were planning on gathering some dandelion blooms today! I also won a large jar of coconut oil a few months back. I cannot wait to try this. My husband suffers from skin problems. Thank you! Just wondering. How how many months would this be good for? If you store it in a cool place, it should last for several months at least. I always keep six to twelve months in mind as a general guideline for how long infused oils will stay fresh, but it depends on oil type, handling, moisture level in the flower/herb, etc. Additions of vitamin E and rosemary antioxidants will delay the rancidity process in oils. If whipped coconut oil gets too warm and melts a few times, it’s still fine to use. You can rechill and rewhip it, if needed. If it repeatedly gets hot though, shelf life will likely be shortened. If you had an allergy to coconut oil, do you think substituting mango butter would work? You could try that out, for sure. One thing to watch with mango and shea butter though is that if they’re overheated, they become grainy. I also make a whipped dandelion cream by using: 3.5 oz mango butter, 1.25 ounces of dandelion infused sunflower oil, and a teaspoon or so of arrowroot (or cornstarch.) Whip the mango butter until fluffy, add the dandelion oil, and starch (and any essential oil for scent you’d like) and then whip it all together until fluffy. This avoids heating those sensitive butters like mango/shea, gives you the benefits of dandelions, & still gives you a light texture. I am confused. You put the dandelions in a jar in a pan with a little bit of water in the pan and nothing in with the dandelions in the glass jar. You never said when to add the coconut oil or where to put it. In the picture the dandilions are in a strainer over a glass jar with yellow liquid in it. The dandilions where in a glass jar..when you heat the dandilions in the glass jar does it produce a liquid you can then strain out? Where do you put the coconut oil and when, and when fo Mr. Dandilions and Mrs. Coconut meet? The coconut oil goes in the jar with the dandelions together. Then that jar is set down into the pan of water. Next, the pan goes on a burner to keep the water warm. The indirect heat from the hot water in the pan will gently warm and melt the coconut oil so the dandelion flower properties (and color) are transferred to it. This turns it a really pretty yellow liquid as shown in the picture, but once it cools, it sets back up to more of a solid. I hope that helps! I so want to try this recipe…dadelion-coconut-oil moisturizer. I have severely dry skin. Thanks for sharing! Hi Cheryl, I hope you get a chance to try it out! This sounds awesome. When you whip the oil mixture at the end it comes out like a whipped moisturizer? Weird that it doesn’t stay more liquidy (I know, not a word :) ) One question, does this have a shelf life? My thought is to make it this summer and give it as gifts for Christmas but will it deteriorate or break down, do you know? What healing benefits does the dandelion have for the skin? I am goi.g to make it, but just wanted to know lol. I put coconut oil in a small flip-top bottle (spoon into jar, melt in microwave, and then a funnel helps for pouring into the bottle) and put the bottle in the bathtub. The oil melts during my hot shower and then is perfect to put all over my skin. Love it! Thank you Jan for your responce!! I have a yard full of the flowers. I usually make dandelion flower tea with them but i want to try this too!! I get chapped lips easy so i thought about adding some vitamin E and some bees wax to make lip balm. 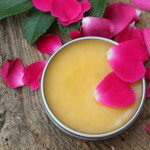 I would love to have the lip balm recipe as well if you would like to share it. I love whipped body butter. I just made some using mango butter, Shea butter, coconut oil, and almond oil. I have found that straight coconut oil can be drying. Do the dandelions help with this? Could mango or shea butter be added? Thank you Daja; I appreciate the pin! This may be a silly question, but I have dandelion tea bags….do you think I could steep them and use instead? I have never dried flowers beforeand was wondering do you use the ones that turn white to? Hi Deb! If some dandelions turn white while they’re drying inside, then I still use them. However, I don’t use the ones that are already white fluffy seed heads out in the field. I just leave them to reseed the area. Two questions. Mayhaps i wish to try this with wild roses instead? Theyre abundant where i live. Would it work? Would it be the same process? And then, the dandelions are also insanely abundant here, but turn white quick. would i be able to collect and freeze them for future use? Or does thatjust not work as well. Thank you!!! Hi Nicole, You sure could use it with wild roses, same process. I made some with dried rose petals before; it’s very nice. It didn’t tint the oil pink like I was hoping for, but still – it works! You could try freezing dandelions for future use, but when they thaw out they’re a little icky. I find it better to freeze dandelions for water based things I want to make (jelly, soap infusion) where they can be used directly while frozen and use dried ones for oil based things. You can dry your dandelions for a few days, infuse them in your coconut oil, and the oil should keep for some time. I might would refrigerate it for longer term storage, but you don’t have to whip it right away. One thing you could try – that I haven’t done yet, but should work in theory – is dry the dandelions and THEN freeze them. Perhaps layered between paper towels? I’m just thinking out loud with that idea, but it’s worth a small experiment at least! Oh thank you so much!!! Ill definately try drying them out. And the freezing. I live in alaska and it gets humid in summer so just drying and storing doesnt always work, especially when you open the container over and over. And i will definately be trying this with the wild roses!!!! Theyre making my house smell lovely right now!!!!! So i need help??? Im following the instructions to the T, but everything keeps coming out smelling like fried food. (which is a wonderful smell :b, if i wasnt using it for moisturizer.). Ok that makes sense. I have my burner down pretty low, but my stove is a bit messed up too, so that could be it. Thank so much for the help. Gonna keep trying this till i get it right!!!! I love this recipe. it is so simple and I always have coconut oil and dandelions in my yard. One question, do you cover the saucepan when you heat up the oil with dandelions? I love all your recipes. I just have one question. Where can I get dried dandelion flowers. I don’t trust the area where I live because it used to be an old cotton field before they build homes on it. Thanks in advance for any help in finding a place to buy. Hi Olivia! I’ve yet to find a good place to buy dried dandelion flowers. I think it’s because they so easily go to seed when dried too long. I have had people write me that’ve purchased wild crafted ones though. You could ask around local health food stores or whole foods type places (the produce manager) and see if they can connect you with a local forager. I hope that helps! Thank you. That did help. Hi Grace, That’s a great idea – thanks for sharing! This is an awesome recipe. Made a trial batch for myself. But decided to make it as a gift for a bridal shower. I’m running out of dried dandelions. Can I reuse them after I strain them. Would it be possible or even advisable to mix different herbs to make an ointment for skin problems: ie: Calendula, Dandelion, Plantain maybe and perhaps a bit of Lavender for antiseptic qualities? Presumably this would be made the same way as the above ointment and salves. Struggling to get Calendula ointment in any local Oldham shops. Just getting over Seborrhoeic Dermatitis. Hi Colin, Yes, absolutely! I’m currently using coconut oil infused with violet leaves & calendula and have another batch infused with goldenseal & plantain I use on a spot on my dog’s leg that she scuffed up. You can combine a variety of herbs as needed. A salve with calendula, dandelion, plantain & lavender sounds wonderful. 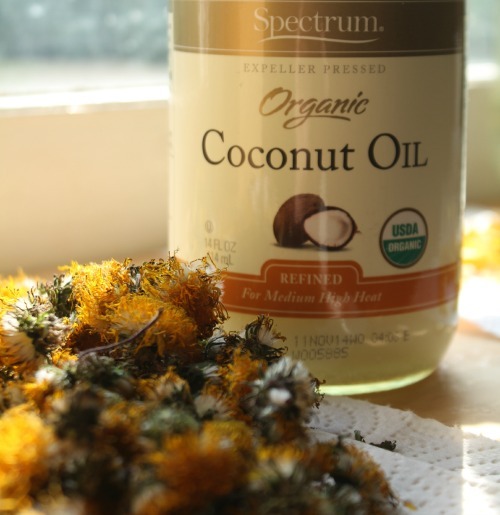 Some people find coconut oil dries and irritates their skin after using for a while, so you might want to use a base of sunflower oil, if you can get that, instead. (I read a study before how it’s better on broken and damaged skin than olive oil. Olive still works too though.) My absolute favorite oil for skin conditions is tamanu oil, it’s wonderful stuff, only pricey and harder to get. 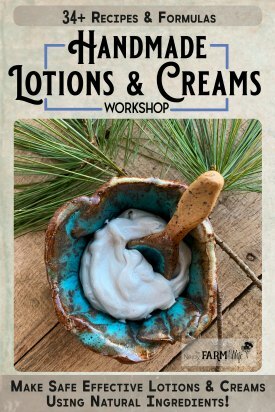 Here’s some info on it: https://www.mountainroseherbs.com/products/tamanu-oil/profile If you could add that to your salve, you might find it helpful, but if not – I still like the combination you suggested. I hope you’re able to create something that works well for you! Can you do this with dried lavender or dried chamomile flowers? Hi Liz, You sure can! It won’t turn a pretty color like the dandelion does, but you can use all sorts of herbs and flowers with this idea. 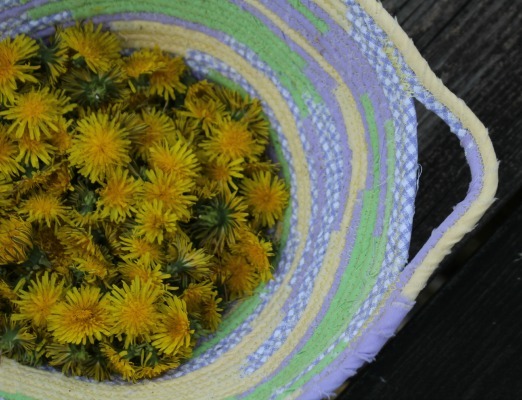 I am still in the process of collecting dandelions and letting them dry so that I can make this recipe. Right now there are not many dandelions so I’ve only collected about 10 so far. The way mine look as they dry are not like yours in the pictures… Mine closed up. I ended up peeling away all the green parts and notice there is HARDLY ANY yellow left. All the petals are so shrunk, you hardly see them. I would take a picture for you, but don’t see a way to attach a picture here. Did you just take a picture of yours when they looked nice and open for the sake of posting this recipe or is that how yours looked after drying for several days? I am wondering because I am thinking mine the way they are wont give a nice yellow color. Also, when making this, do you remove ALL of the greenery or only the stem part, but leave the tiny green pieces around the flower? Lastly, if I collect dandelions and press them in a flower press, would that work, too, since technically they are still dried that way? When I press dandelions, they turn out super flat, but are still full of color. I was thinking that pressing them would be an easier way to collect and save them till I have enough to make the recipe or a larger batch. Hi Christine, Questions are great – that’s how we learn! :) I think sometimes it depends on when you pick your flowers – if they’re about spent and not far from turning to seed, they’ll dry up a lot smaller and may even develop the white seed heads while drying. Early in the season too, the flowers are small, so dry up like you describe. When at their peak, a lot of the flowers are huge and gorgeous and they dry out pretty, like the photo. All of that is okay, the dandelion goodness is still in there, just in a harder to see form! You don’t have to peel the green off either, especially if you’re making salve. I like your idea of pressing the flowers though – I would definitely give that a try! It is really hard to dry dandelion flowers, most of mine went pooffy too. Hi Linda, They can be finicky! Some batches seem to do better than others. could you use a dehydrator to dry the flowers? or is air dry on the counter best? Hi Jennie, I haven’t tried that yet, but it seems to me it should work well. I’d try a small test batch out and see how it goes! Great post. Followed you from the Art of Home-Making Mondays link-up. Love for you to come by this week’s Wildcrafting Wednesday and share. Can this dandelion infused oil can it be used as a carrier oil? Can it be used in bath bombs, bath melts? Hi Valerie, It sure can! I JUST made bath melts with some today, in fact. It has lots of uses I haven’t had time to cover here yet and probably plenty more to be thought of! I am loving your recipes! Question: Can I use tapioca powder in place of arrowroot? Hi Debra, I’m happy to hear that you enjoy the recipes! Tapioca powder, like this one: http://www.brambleberry.com/Tapioca-Powder-P3803.aspx is a wonderful replacement. In fact, I can’t quite decide, but I may like it a bit better than arrowroot. It’s just that arrowroot is a lot easier for me to buy locally, so I tend to use that more. Can I use dandelion tea instead of the dried flowers? Do you mean dried dandelion tea, like these? If so, you probably could, but you won’t get the same bright yellow shade. 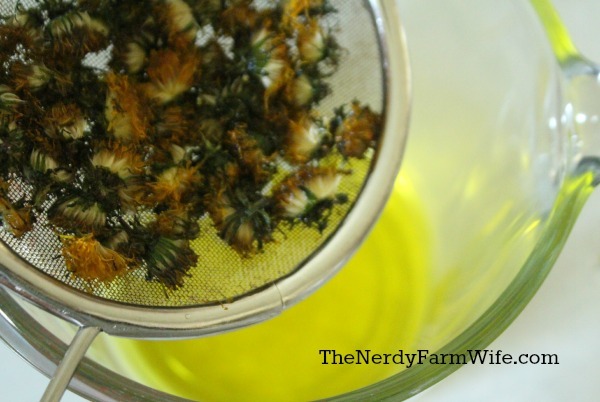 If you want to keep the pretty color, along with skin benefits, then you could try dried calendula flowers instead. Chamomile flowers usually tints oil a pale yellow, so you could also try testing out a dry chamomile tea, to see how it does. Im getting ready make this when my flowers dry but curious if it has the nice dandelion smell?? Hi Crystal! I find that it doesn’t have much of a smell – perhaps a little herby & plant-like, but not floral. Our yard and field is full of dandelions (we live in the country and have acres!). My husband was getting ready to go out and spray weed killer on them and then run the lawn mower over them. I had heard of dandelions having a lot of benefits and shouldn’t treat them as a pesky weed. I came across your site by googling what to do with these flowers (I don’t think I’m ready to ingest them quite yet, but won’t mind trying the oils and creams). But I have a question. We have a really small farmhouse and I don’t have anywhere to really lay them out to let them dry. Instead of letting the flowers dry naturally over the course of several days, would it be ok to put them in a dehydrator? If so, have you ever tried that and how long would you recommend to dry them? Thanks. Hi Cindy! I’ve not dried them in a dehydrator, but I’ve heard of others who have done so successfully. I’m not sure of an exact time frame, but if you check them fairly frequently, you should be able to get them just right. How wonderful to have so many dandelions available to use! I hope you enjoy the projects!